Black, white, and stainless steel look even more modern with a pop of color—in this case citron-green stools (made of easy-to-clean vinyl). Concrete flooring keeps the look cool. 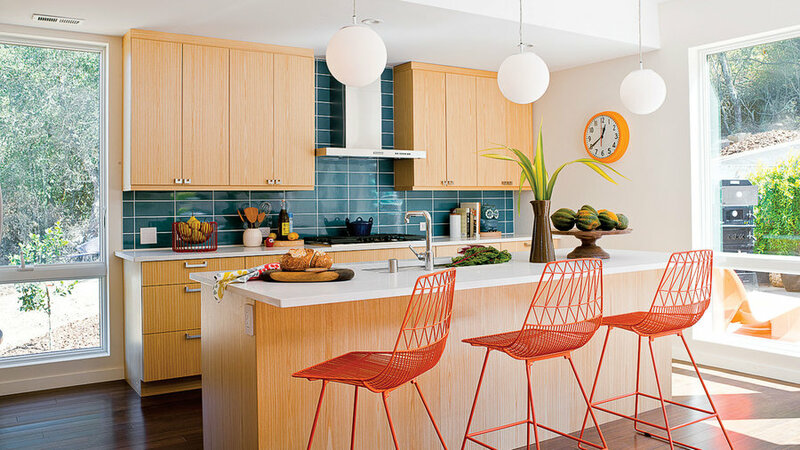 Streamlined blonde wood cabinetry and globe lights are hallmarks of modern design; the tomato-red stools and blue-green add friendliness. 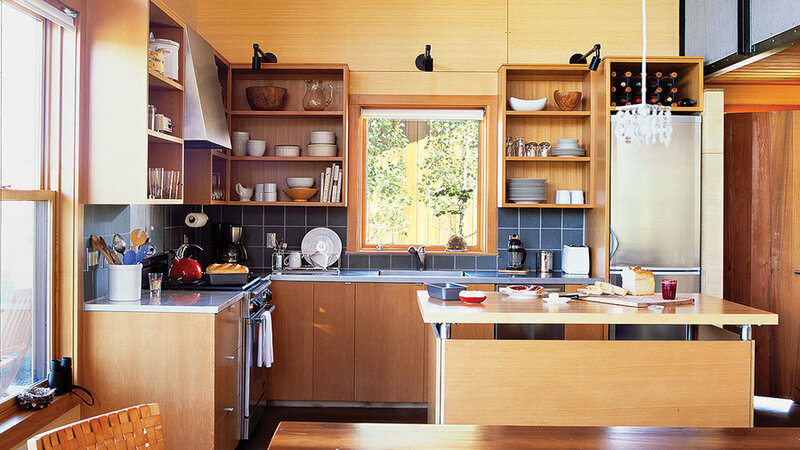 This kitchen operates with very little closed storage, so dishes double as visual accents in the room. Glassware lines a long open shelf and a custom island holds a collection of modern dishes. 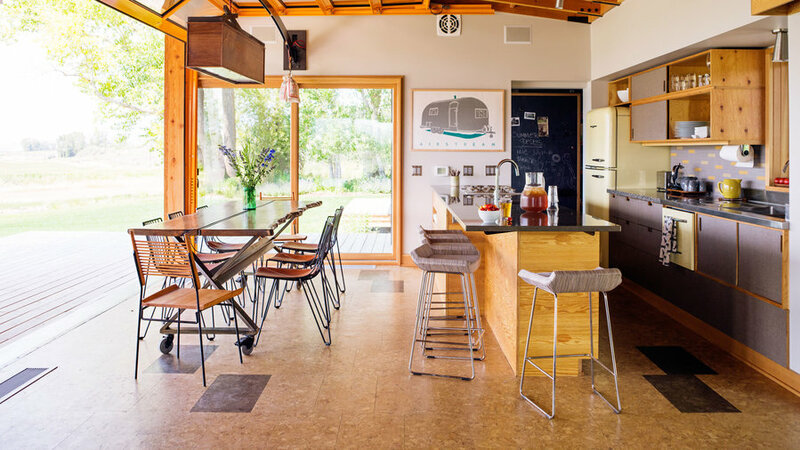 To create visual interest in this prefab kitchen, the designer incorporated textured elements, including cork floors and a wild-edged, reclaimed walnut table. 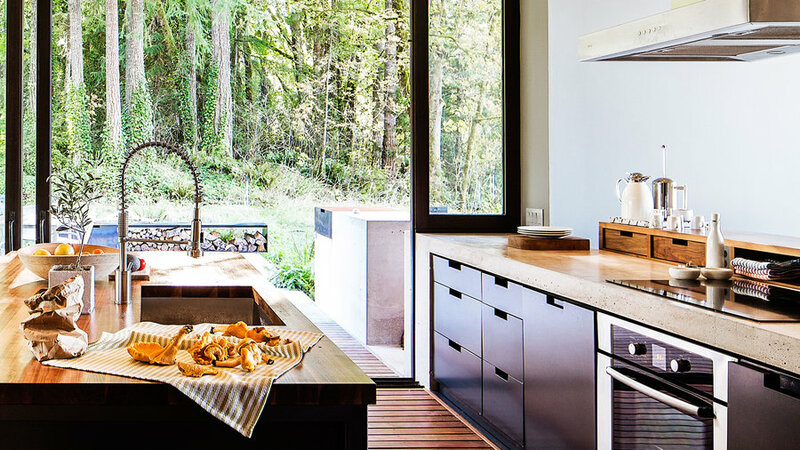 The kitchen walls slide aside to access a 450-square-foot deck that includes a barbecue station, effectively doubling the room’s square footage. The ipe flooring flows from indoor to out, creating a cohesive look between the spaces. 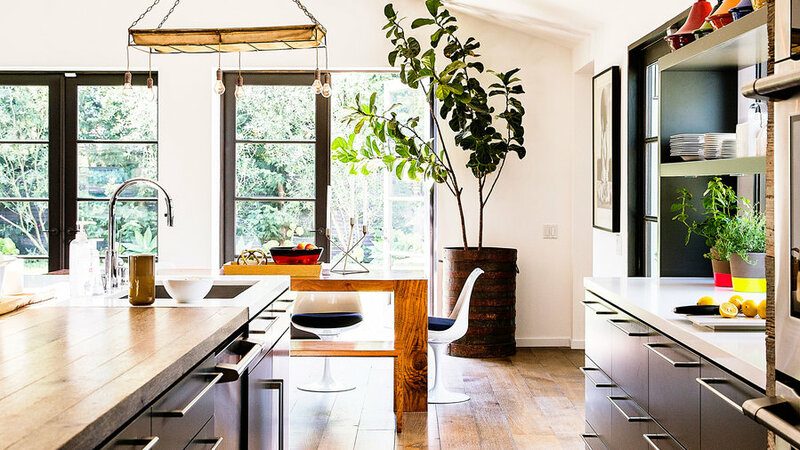 This kitchen room may have the clean lines of a modern space, but the materials add a rustic vibe. 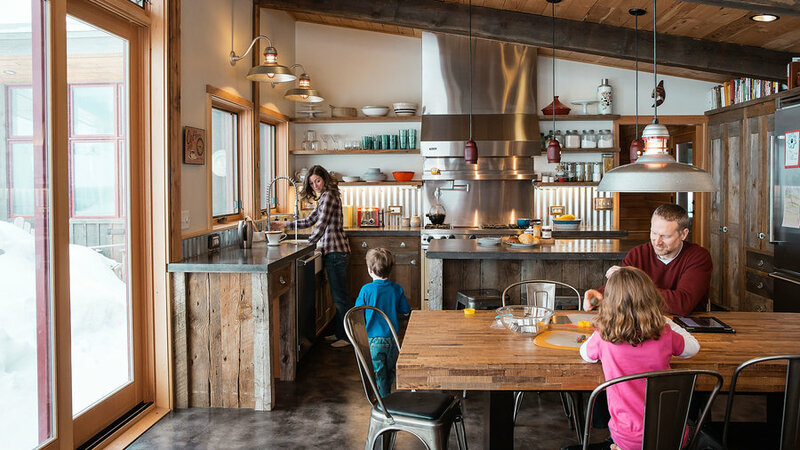 The cabinetry is made of reclaimed barnwood and the backsplash is corrugated metal siding. 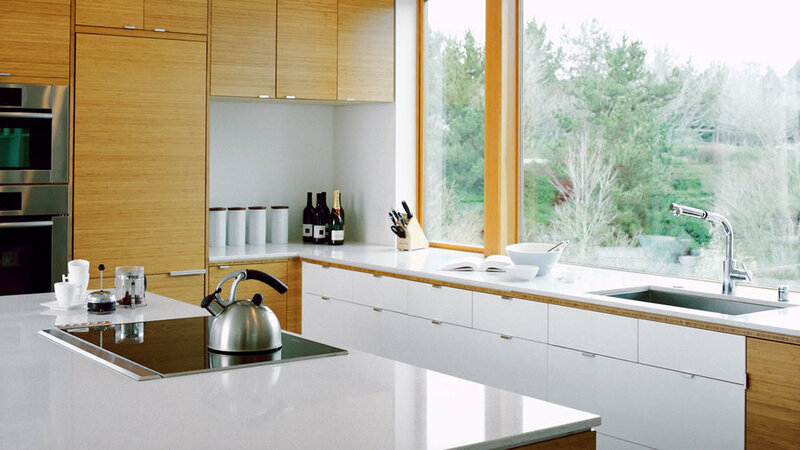 Flat cabinets with simple hardware and sleek countertops give this kitchen its distinctly contemporary look, while an oversized window over the sink makes the most of the view. Because this kitchen is part of a great room, it needed to fit in with the rest of the home’s modern style without looking utilitarian. A butcher block-topped island, dark cabinetry, and a herringbone-patterned floor help the cooking area blend in with the other living areas. Ebony-stained kitchen cabinets serve as a counterpoint to the white walls and light-colored flooring. The black-and-white tile ties it all together, while the brass hardware adds a touch of glamour. 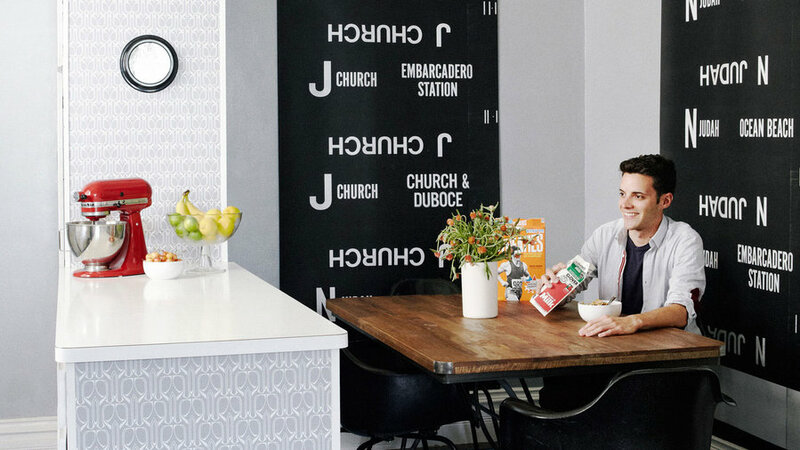 Many of the surfaces in this kitchen are sleek, from the glossy table to the concrete floors. But on the cabinets, flakeboard (similar to plywood, but made with wood scraps) adds an unexpected texture–and is economical too. Varying finishes and styles give the kitchen character. A dark green La Cornue stove contrasts with light oak cabinets, stainless-steel appliances, and bright yellow artwork. 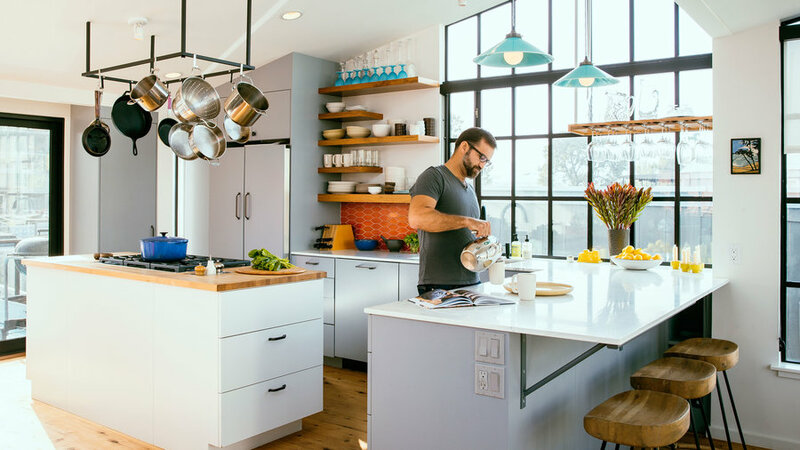 This island was made from a stainless-steel and butcher block workspace from a restaurant-supply store that the couple covered on three sides with plywood, to help it fit in with the rest of the light wood in the space. In this open kitchen, walnut cabinetry visually links the room to the dining and living spaces around it. 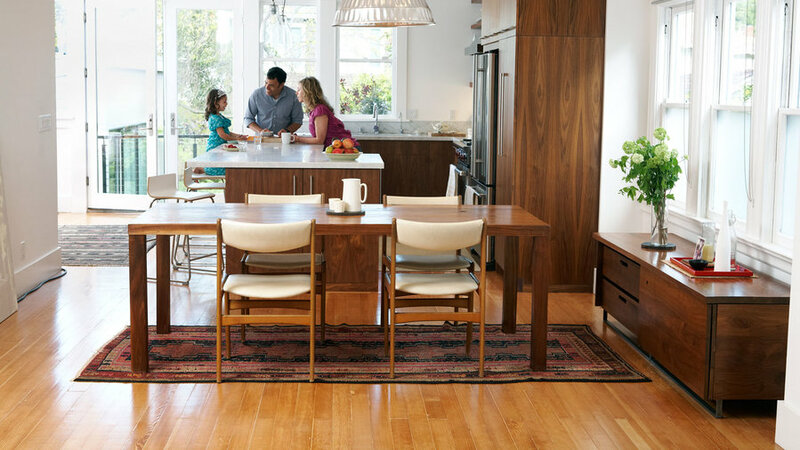 The large kitchen island acts as a casual spot for family meals—an alternative to the more formal dining table. 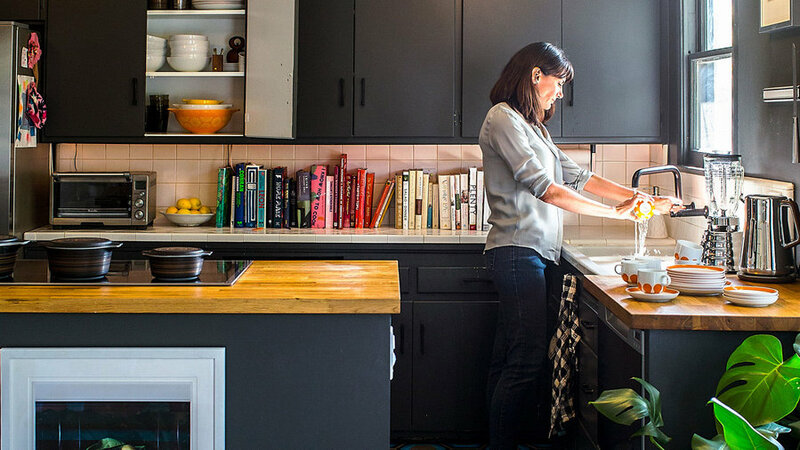 In designing this tiny kitchen, the couple went through their cookware dish by dish to come up with the right division of space. 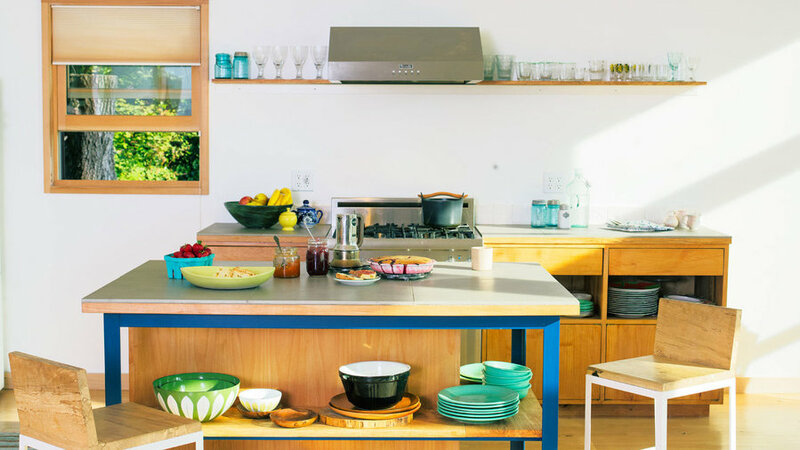 Hanging racks hold glassware and pots; the island includes custom spice drawers, a pullout chopping block, and shelves for cookbooks. A brick-red island is the star of this kitchen. For a sophisticated look, pair one colorful object with neutral tones. 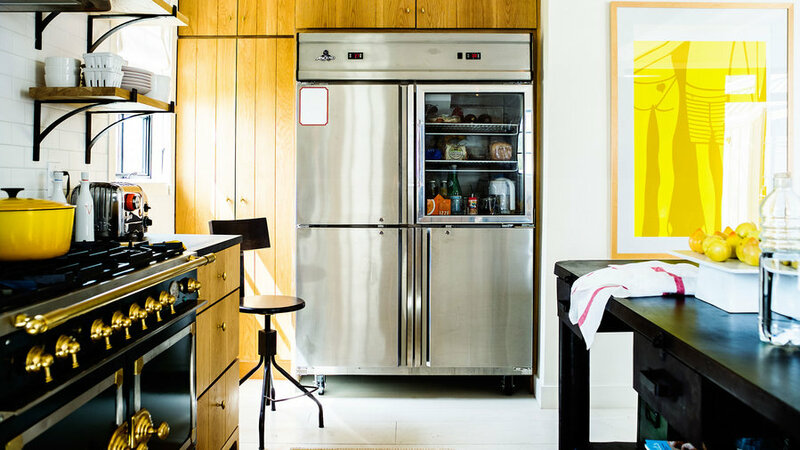 Here, dark-wood surfaces and stainless steel appliances do the trick.